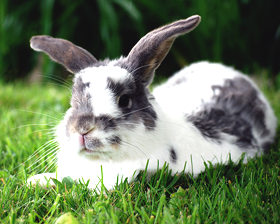 Sometimes our pets (guinea pigs, hamsters, rabbits, rats, mouses) require grass as an addition to their diet and/or digestion. Sown like indoor cress, and growing almost as quickly, this will provide the fibre, vitamins, ferments and microelements they need. Sow at any time of year in a pot or box and place on a window ledge or cool, well lit spot, where the rodents can browse on it. Keep moderately well watered.